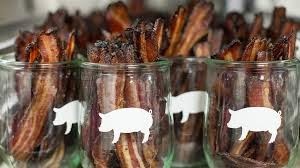 Cochon 555, the country’s most talked about culinary competition returns to Chicago on April 26, 2015 to celebrate family farms, heritage breed pigs and today’s emerging chef community. This must-do culinary experience features five top chefs in a one-of-a-kind culinary competition featuring over 36 dishes prepared from locally-raised whole heritage breed pigs with endless wine, brews and spirits. The chefs, champions of whole hog utilization, will prepare a maximum of six dishes with hopes to win votes from a crowd of hungry gourmands and celebrated judges. A pack of notable judges will be led by Chicago’s 2014 “Prince or Princess of of Porc”, Tim Graham of Travelle, who will be joined by several others including, Carlos Gaytan of Mexique, Andrew Zimmerman of Sepia, and past Chicago champion and 2012 “King of Porc, Jason Vincent. The winner goes on to compete for the title of “King or Queen of Porc” at the tour finale, Grand Cochon at Snowmass/Aspen in June. The grand champion will be rewarded with a 4-day wine experience in Rioja, Spain’s most prominent wine region. And, new in 2015, the winner’s kitchen countertops will be resurfaced with Wilsonart® Quartz decorative surfacing, a remarkable, beautifully engineered stone material from America’s countertop leader. 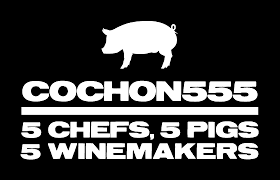 “We are thrilled to welcome the Cochon 555 Tour to the Fulton Market District. This epic culinary experience further validates the area’s rich business mix and celebrates its meatpacking history, award-winning chefs and innovative industries,” said Rod Burch, Executive Director, West Central Association – Chamber of Commerce. Located in the hot West Loop neighborhood, Chicago’s Fulton Market District is home to some of the best restaurants, boutique hotels, event & entertainment venues and innovative technology companies like Google and Uber. The Chicago version of this fairy-tale heritage pork event includes more than 36 chef-prepared dishes in an all-inclusive stand up reception with notable tastings from Washington State Wine, St. Francis Winery and Sleight of Hand Cellars. Cochon’s “pop-up” culinary experiences include the Petit Format Bar presented by Wilsonart® Quartz decorative surfacing featuring a selection of amazing half-bottles, hand-sliced prosciutto from Prosciutto di Parma and the Wines from Rioja Tapas Bar featuring Chef Jason Vincent preparing delicacies from Agromar. Guests can visit the Mezcal Chupito Bar and enter to win a 4-day Mezcal adventure to Mexico from Panna Cooking and Mezcales de Leyenda. Upon arrival, guests will enjoy Buffalo Trace’s “Welcome Punch Reception” paired with a delicious bite. Attendees will sample foods at Cochon’s signature experiences including the Artisan Cheese Bar from Pastoral Artisan, the Oyster Shelf presented by Pearl Oyster Tavern and the famous TarTare Bar featuring Creekstone Farms prepared by Chef Andrew Zimmerman. Bourbon and whiskey lovers rejoice with the return of Whistle Pig Rye and the “Perfect Manhattan Experience” featuring Eagle Rare, Buffalo Trace, Breckenridge Bourbon and Hirsch finished with Luxardo cherries in this hand-prepared classic topped with a special treat from Creminelli. Guests of VIP can enjoy samples from five of the city’s best barkeeps as they compete in Punch Kings – the tour’s whole bottle “meats” golden gloves competition, featuring Breckenridge Bourbon. As guests leave the event, they’ll receive a special departing gift from La Brea Bakery. We are proud to announce the return of the Pop-Up Butcher Shop with the support of Williams-Sonoma – a live butchering demonstration with Rob Levitt of Butcher & Larder raising money for the supporting culinary students from Kendall College. Finally, a spotlight Awards Toast to announce the winner. Following the event, all guests are invited to the Chef’s After Party. Also on Saturday, Cochon 555 founder Brady Lowe will lead a special panel discussion on the husbandry culture at Pastoral’s 5th Annual Artisan Producer Festival at Chicago French Market (131 N Clinton St). Other panelists include Veronica Baetje, Owner & Cheesemaker at Baetje Farms, Cristiano Creminelli, Owner of Creminelli Fine Meats, Andy Hatch, Owner & Cheesemaker at Uplands Cheese, and Andrew Jones, Owner & Winemaker at Field Recordings. This is Pastoral’s 5th year hosting the Festival created to make buying and eating great food and wine a fun, inviting and educational experience. The Festival is FREE and open to the public, and features nearly 100 producers of artisan cheese, bread, wine, charcuterie, confections, and more offering tastes of their products. 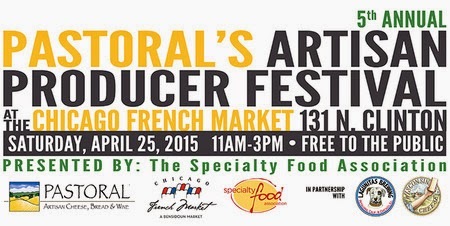 For more information, visit the Artisan Producer Festival website.